Natalie Roth and Trisa Hutchinson have been friends and golf teammates since seventh grade. Now NDSU seniors, they are hoping to bring home one more title. Natalie Roth and Trisa Hutchinson have been friends and golf teammates since seventh grade. After winning three state titles together at Detroit Lakes High School, both decided to continue their playing careers at NDSU. Now seniors, they are hoping to bring home one more title, but this time as Bison. Detroit Lakes, Minnesota, has a population of more than 9,000 people but is still considered a small town by Minnesota’s standards. So when a new student begins there, most classmates know about it. Such was the case when Natalie Roth moved to Lake Park in seventh grade and decided to attend Detroit Lakes High School. Trisa Hutchinson found out a new girl was coming to town and wanted to meet her. They became friends instantly and Hutchinson convinced Roth to join the golf team. That was three seasons as NDSU teammates and five seasons as Lakers teammates with three high school state championships together ago. Both are now seniors for the Bison golf team. This is their last season as teammates, but like any golfer, they aren’t looking too far ahead. Roth and Hutchinson have enjoyed a lot of successes together. They were all-state golfers in high school from their freshmen through senior seasons. Along with the team titles, Roth won an individual state championship her junior year and Hutchinson took third her senior year. The decision to come to NDSU was made separately. But they were excited about continuing to be teammates and were even suitemates freshman year in the dorms. “Even going to tournaments, how to act, what to bring and what to wear and things like that,” Hutchinson added. They both competed in double-digit events as freshmen in the 2014-15 season. Roth began to make a name for herself as a top golfer in the Summit League soon after, being named all-conference her sophomore and junior years. Hutchinson has seen first hand her friend and teammate grow as a golfer. 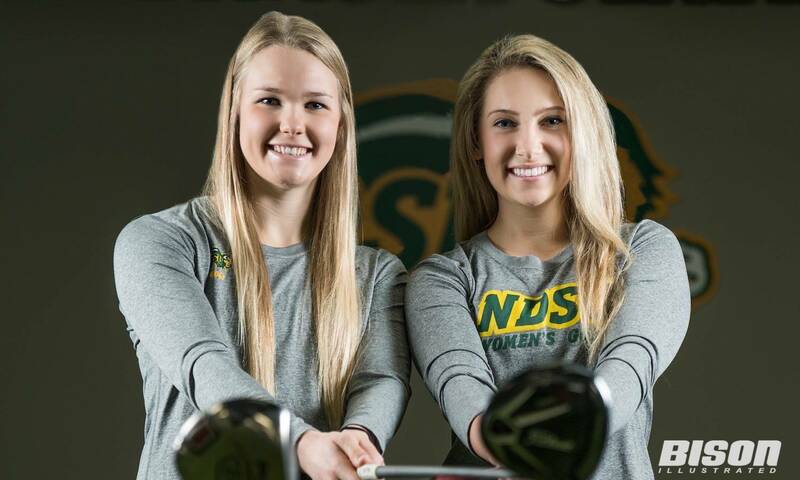 The two are the only seniors on NDSU’s roster and are hoping to bring home the elusive conference team title. The Bison haven’t won it since 2013 and have finished third the last two seasons. As for what the future holds after their Bison careers wrap up, neither wants to think about it too much. But two things are for certain: Roth plans to continue playing golf competitively at the next level, and the longtime friends are still going to hit up the links together. “Natalie and I will always play golf together,” Hutchinson said. “Maybe I’ll watch her on TV one day or maybe I’ll have to pick up the bag as her caddie. But it’s one of those things where you grow up playing a sport with someone, especially a lifelong sport like golf, you’re never going to not play it.